Police who don’t pepper spray protesters are too liberal. There are communists running our police departments across America and we must put a stop to them before the Occupy Movement really gets out of control. Take a look at this video at UC Davis. If you take a close look, you can see a large police officer in his riot gear, standing over the protesters who are sitting crouched and bent over and obviously posing a threat to the police by being submissive. He and other officers needed to spray those threatening college kids. Those students have been breaking the law by trespassing on college campus grounds. Do they think the universities are there for students? What gives them the right to protest tuition increases? Where is it written that they can ask their grievances to be addressed? Frankly, we should pepper spray anyone who dares to speak out of turn when they should be silent. It is a valid use of force. Every teacher in America that doesn’t have a can of pepper spray in their desk drawer next to their 9 mm is a liberal coward. Besides, pepper spray is a food product, essentially. Bus drivers across America should have pepper spray to deal with unruly passengers and to spice up their chinese take out. Parents should have pepper spray given to them when they have a child just in case. The point is, there are many socialist police departments out there that have yet to use pepper spray on their local Occupy Movement, and we need to black list them and call them out for the coward they are. More rubber bullets and concussion grenades, especially when protesters try to help an injured person. Water board protesters. Since it’s not torture (it’s just enhanced interrogation) no problem. Blast in a cavalcade of worst songs ever to the occupiers including “MacArthur Park” by Richard Harris, “(You’re) Having My Baby” by Paul Anka, “We Built This City” by Starship, Uptown Girl by Billy Joel, and many many more! Collaborate with other mayors to crack down on free speech. Call in the Police Executive Research Forum or PERF. PERF those protesters! Whatever you do, side with the 1%. While they may take money from your 401k for their yachts, poison our water supply for profit, privatize your kids school and ask tuition while lowering standards, sell you out to the banks, bring back child labor and get rid of the eight hour day and minimum wage, it’s better than having to listen to a bunch of hippies and getting upset with our nations economic and political problems that they unpatriotically discuss. One of the strategies that Occupy Wall Street has used to bring media and political attention to their movement is civil disobedience, namely, through trespass. Trespassing has been used by movements throughout the history of the United States and today it takes on even further significance through permanent trespass called “occupation”. One strategy authorities have used to counter these social movements, as they have the Occupy Movement, has been the use of trespass laws to squelch dissent. Those words, uttered over 100 years ago, mirror the economic troubles we are faced with today: record foreclosures, long term unemployment and a widening income gap. The work of millions is stolen for the fortunes of a few. During the Great Depression, there was another group of trespassers that got the ire of the government, the Bonus Army. In 1924, Congress voted to pay $3.5 billion to veterans of WWI. Congress decided to pay the bonuses over 20 years. However, during the Great Depression, many of the veterans were having difficulty finding work and decided that they needed their WWI bonuses right away. So in 1932, about 10,000 vets marched on Washington, D.C. to ask for their bonuses up front. A bill to pay the veterans was passed in the House on a vote of 209-176. However, the Senate voted it down, 62-18 before it could get to President Hoover who had promised to veto it. 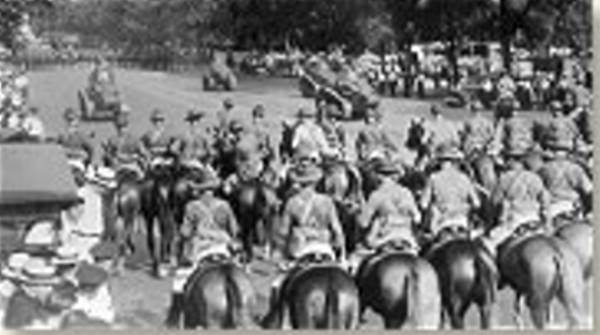 Army Chief of Staff MacArthur was convinced that the march was a communist conspiracy to undermine the government of the United States, and that “the movement was actually far deeper and more dangerous than an effort to secure funds from a nearly depleted federal treasury.” But that was simply not the case. The government’s response to the occupation of the Anacostia Flats across the Anacostia River from the Capital was to send in the military, under the direction of Douglas MacArthur, and evict the veterans. The demand for their pay was too much for many. Without firing a bullet, but with ample use of tear gas, MacArthur proudly removed the desperate veterans who were asking only for the wages promised them. In the Flint autoworkers strike of 1936-7, the workers surprised management and took over the Fisher Body Plant on Dec. 30, 1936, trespassing on private property. And they called on the people of Detroit to occupy public space to show their support. Many blacks and some whites trespassed in white only lunch counters in the South during the Civil Rights Movement and sit-ins, a popular form of protest in the 60s and 70s, were also utilized by free speech movements. The American Indian Movement occupied Alcatraz Island as a way to protest treatment by the United States government. Times have changed, and the goals of the protesters are not so obvious today. 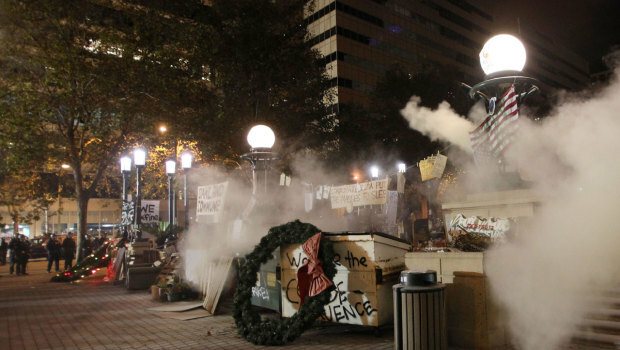 The current Occupy Movement is not only a fight for a living wage, but for something grander. The economic forces we fight today are as powerful, but they are also more diffuse and harder to understand. The Coxey Army wanted jobs. The Bonus Army wanted the money promised them for their service during WWI. In the Fisher Body Plant in Flint strike of 1936, the workers wanted the eight hour day, a fair and living wage, and job security. Others trespassed for civil, political, social, racial and economic equality. Trespassing is one of the only ways disenfranchised groups of people can get the attention of non-responsive governments and massive corporate controlled media conglomerates. By trespassing, we are saying that mega-corporate occupation of the power and wealth of this nation is illegitimate. We are here to take our power back and do our best to divest from an economic system that harms us and our fellow citizens. Wealth made through market manipulation, deregulation through legalized bribery of Congress and usury must end. Wealth made on the backs of workers, home owners, students, immigrants, and others who suffer hardships due to this economic usury must end. Wealth accumulation without regard to the economic well being of the people and the nation has to stop if we are ever going to have a sustainable economy that benefits everyone and not just the 1%. Until this happens, the cycle of boom and bust that only benefits those who can manipulate Wall Street and threaten economic collapse to extort bailouts will continue unabated. Thus, we also fight to repeal Citizens United and tax Wall Street trade as well as making the top tax brackets pay their share in taxes for the services and infrastructure this nation creates for their companies to thrive, among others issues. The standard counter-social movement strategies are being used to repel the occupy movement today, including labeling the groups communist (tired as that is) or Nazi and using trespass laws to cite, arrest and removal of occupiers. One reason the brutality of the police in Oakland, Berkeley, Denver, Portland, Tulsa and elsewhere is so shocking is because the protesters have framed their struggle in counter to the excesses of the state and corporations, and the police, as corporate/state operatives, demonstrate these excesses. If you like the status quo, I ask, why do you support the banks over the people? Do you like paying to bail out the banks thus leading to the lay off of teachers and other public servants? Do you like corporations that give multi-million dollar bonuses and pay zero taxes? Do you prefer corporations buying elections because you weren’t really using your vote anyway? Think about what you are supporting before stereotyping and dismissing those that obviously care about people and the state of this country. Support an Occupation in your area. And if you already support the Occupy Movement, spread the word. In yet another example of police protecting property and the law of the 1% above the Constitution, people, and common sense, Occupy Tucson has been evicted from Armory Park to nearby Viente de Agosto Park, around 12:30 AM on Nov 4th. To move the 20 overnight occupants of the park, the police department used 60 police officers. Was this use of taxpayers money and overwhelming force really necessary to move the peaceful group? 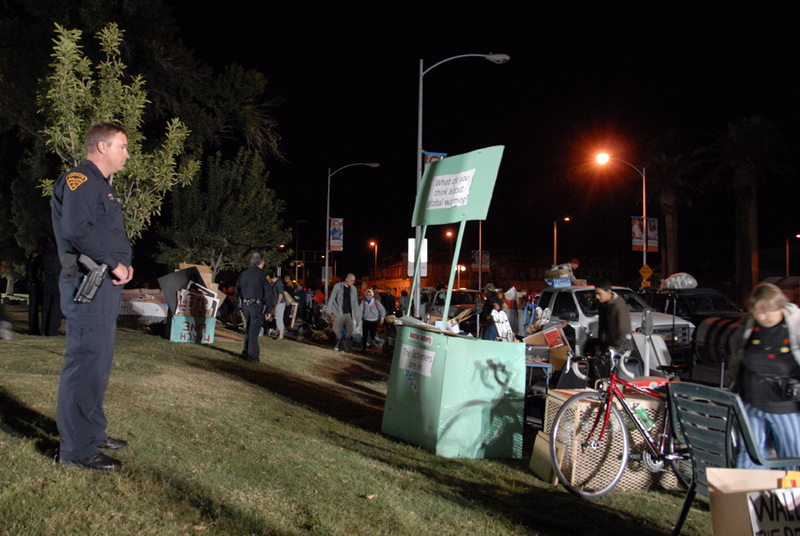 Although Occupy Tucson was evicted, the police did let other members come and help the overnight residents move their tents to the nearby location. The police didn’t use tear gas, concussion grenades or other use of force as they have in Oakland, Tulsa and other cities, and they didn’t arrest those present with few exceptions. However, the move was unnecessary. Occupy Tucson had already come to an agreement with the permit holders for their Nov. 5th Little Angels celebration to move their tents out of the way of the celebration and to monitor the event to keep it safe and fun. The police either didn’t talk to the permit holders or care about the cooperation between the groups. A spokesperson for the Little Angels event assured me that a letter was sent to the police about our agreement and cooperation for the Nov. 5th event. The letter appeared to make no difference in their decision to evict the group. It is also unclear whether the police were “just following orders” of the city manager, mayor and council, but in Albany, the police refused orders to arrest protesters. While the new location is strategically located, it lacks the public facilities, power, toilets and size provided by Armory Park. And who knows what excuse the police will use to evict the group from the new location. It is clear that unless the city manager, mayor, or city council steps in to support the group, the harassment may continue unabated with more citations being issued. Contact the mayor and city council of Tucson to let the occupiers practice their First Amendment rights peacefully and secure from police state interference.